Most of Okinawans like to add some Beni Shouga to their bowl of Okinawa soba. 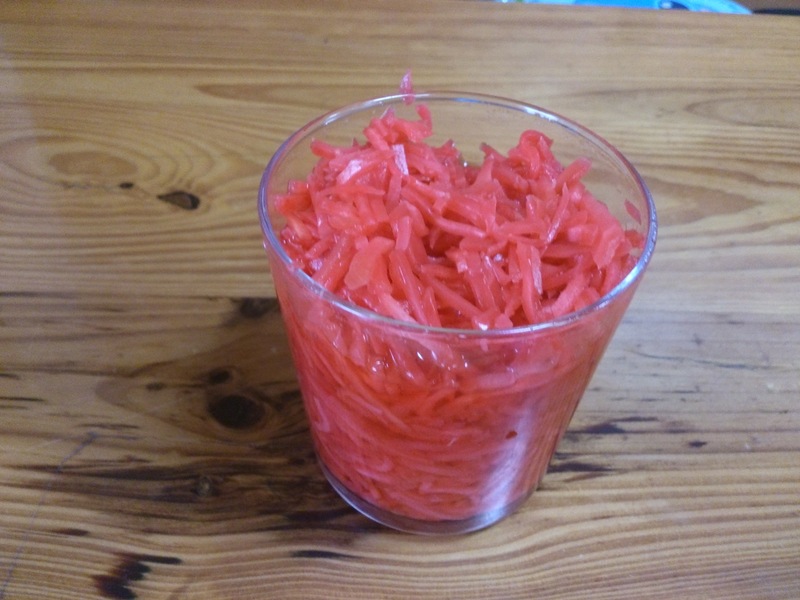 Beni Shouga is grated red pickled ginger with tangy taste. All Okinawa soba restaurants have small jars of Beni Shouga on their tables for customers to spice their soba with for free as they like. Some people like to use it quite a lot while some add just a pinch. You can buy it at any supermarket on Okinawa, and in addition to soba joints, Beni Shouga is served with Okonomiyaki, Takoyaki, Gyudon, Sushi and other dishes in Japan. Its red color comes from “ume” pigment.